Lock in a great price for Ananda Beach House – rated 9.4 by recent guests! I liked everything. Location is perfect. Staff are very friendly. Internet was perfect. I was able to video chat with my family even from the beach. It was clean, neat and loved the location of the property. We did not choose to have breakfast but we've been told by other that is tasty. The location is out of this world as it gives you an unique feeling with so little tourists. Also being right on the beach makes Ananda an amazing place to spend holiday. 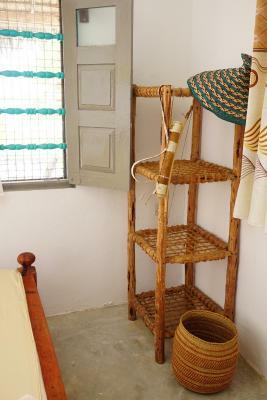 The bungalow was spacious, clean and well furnished. The bed was comfortable and the shower had hot water. The room was cleaned each day. They had a laundry service. There was an outdoor lounging area set off from the main beach which was great. The included breakfast was good. Ciprian was friendly and helpful assisting with ordering taxis and arranging day trips. You could store food items in the fridge and use the kitchen to make a meal. The owner of this property went above and beyond to make sure our stay was what we expected. You can’t beat the lounge chairs under the Palapas when the afternoon heat hits. There are lots of great restaurants and cold drinks close to Ananda Beach House. Thanks for everything Ciprian! - Location, staff and atmosphere is perfect! - Great customer service - Rooms are clean - Mosquito nets. - You will definitely have a comfortable, hassle free and easy stay here! Ciprian and Angela are amazing and the most gracious and kind hosts. They were so knowledgeable and helpful with everything from booking us cars to providing suggestions for restaurants. The location is also right on the sandy beach within easy walking distance from many of great bars and restaurants. I would definitely recommend Ananda! Ananda’s in a diamond in paradise. Perfect location, amazing views, great breakfast... They make you feel at home that you will not want to leave. Everything! The staff are so very friendly and accommodating. The room was clean and had a/c, lots of opportunities to socialize, steps away from the beach....it's an amazing experience. Ananda Beach House was an amazing place to spend 7 nights in Paje. Right off of the beach and right in the middle of Paje. Within walking distance of atm. Good food options close by and self catering easily done. We got our room cleaned and our room sprayed with mosquito repellant every night. Our room and bathroom we're very spacious and functional. Ciprian and staff were amazing. They are all so nice. They have just the right amount of professionalism and laid back attitude. The lounge areas are very relaxing and well spaced out. We loved going out during low tide and spending hours looking at the coral and catching a ride on the tide on our way back. One of our best sellers in Paje! Located in Paje, near Paje Beach and Supermarket (Paje), Ananda Beach House features free WiFi, and guests can enjoy a private beach area. Guests at the lodge can enjoy a continental breakfast. Jozani Chwaka Bay National Park is 9 miles from Ananda Beach House. When would you like to stay at Ananda Beach House? House Rules Ananda Beach House takes special requests – add in the next step! Ananda Beach House accepts these cards and reserves the right to temporarily hold an amount prior to arrival. Please inform Ananda Beach House of your expected arrival time in advance. You can use the Special Requests box when booking, or contact the property directly using the contact details in your confirmation. Nothing. But the seats, chairs for the common area are quite old. Not very comfortable to have breakfast there. Smelt like fish and a few flies around kitchen and toiletries Toilet close to kitchen and shower- so was a bit awkward... air con was so cold at night and only a tiny sheet to keep warm. Slept under my towel! The shared toilet and bathroom right next to kitchen, it was awkward in the mornings. Great location, right on the beach, close to good restaurant, staff very helpful, nice lounging area outside for sunbathing. Wow one of the male managers was so not friendly, never greeted guests, never smiled. Pointed and referred to me as 'her' and didn't speak to me directly even through I was standing next to him. Even got shamed for not being a morning person. The en suite bathroom needs an upgrade. The private sea view room has a window to the patio but this is the common space and people are right outside your bed until midnight and up early in the morning, so I didn't get good sleep. The mosquito net doesn't quite reach the floor and I got bit overnight. Not enough sitting space for breakfast so I ended up going to another cafe. Great location facing the beach, close to the main intersection. The lady who checked me in was fantastic, friendly and super helpful as she provided a map and recommendations. They were very responsive prior to my arrival. No hot water in the double room with sea view. Oops only a little piece of sea view through the veranda. The owner didn't even say hello, was just sitting there starring at his mac. Dorm room is with air conditioning, safes available. Facilities are very basic and when somebody uses the sink no water is coming out of the shower. The "garden" area is amazing, great to hang out and relax, during high tide swimming is great too! Breakfast is available, but I didn't try! Lots of restaurants and bars around! Good breakfast, nice people and verry good service! Perfect location in front of the beach! The only problem for me was the fridge, it wasnt working properly. Location is great, right in front of the beach. Helpful, kind staff, very chilling atmosphere, close to very nice restaurants. Definitely worthed to stay. A lot of ants in the room and insects. The mosquito net does not fit the bed and not protect you properly during the night. Nice Location. If you have a Bungalow you hear the sea from your bed and can even see it. Staff is very friendly and helpful. Small sunny balcony for breakfast is really not very comfortable. Breakfast itself - be careful and watch what you eat! We´ve got old bread with mold, always need to ask for salt, sugar,.... Beach is very beautiful, if you are a kite lover. If you want to swim, choose different type of beach. Location, clean bungalows, beach just in front of the garden, nice staff, you can easily visit massai village just behind the bungalows - be aware of bagging children around. I loved everything. The staff was super friendly, very helpful and amazing to be around! Marie, Andre and Angel took amazing care of us, the chef (forgot his name) always cooked very tasty breakfast, they took us partying to nearby Jumbo club, helped to organize snorkeling trips... I can say I made life-long friends! The room was always clean and even though there was only a fan in the room, it was enough even during hot and humid nights. This place over-exceeded my expectations! THANK YOU!